Purchase The Eye's Mind PDF on USB for viewing on computer and your device - $59.00 plus $10.00 Australia wide standard postage. 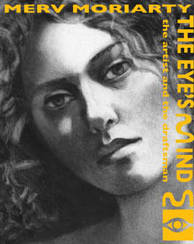 The Eye’s Mind - the artist and the draftsman, looks at drawing skills from the point of view of the way the mind behind the eye creates the experience of vision for us. A closer and deeper look at the way the mind creates our visible world can reveal to us that drawing is an essentially human ability to make direct contact with our own vision system and apply the fruits of this contact. At the same time it is an ability to tap into the very centre of our consciousness, our imagination. It is this imagination that creates the world we experience and yet at the same time provides us with the tools to modify it and - (to quote from Fitzgerald’s Omar Khayyam) remold it nearer to the hearts desire. To tap into this ability at an effective level requires skills, not only of the hand but also of the mind. This book focuses on each of these skills separately and together providing you with a deeper understanding of their real nature. Exercises that help you to develop these skills and understandings are clearly described. The Eye’s Mind - the artist and the draftsman begins with fundamental drawing and draftsmanship principles and develops through a series of steps covering everything that the artist-draftsman needs to know. This book puts you in touch with the analytical factors that the mind behind the eye uses to create form and space. In turn this potentially gives you command over the intellectual tools that can create a visual world on paper or canvas just as you intend. Rightness of form and structure has been a fundamental pursuit of artists since the earliest times and this rightness has its roots in factors of a mathematical nature. These factors are addressed toward the end of this book and will, I believe, throw light on a matter that could give you access to understanding and skills that will lift your work out of the ordinary to another level. It will also help those who wish to understand art and the forces that not only lie at the heart of all great art, but also underlie our appreciation of nature and of beauty.